Andrew Farke discovered his interest in paleontology while growing up in rural South Dakota, and was able to develop his first research in the field thanks to the long-distance mentorship of many professionals and amateurs. He received a B.Sc. in Geology from the South Dakota School of Mines and Technology in 2003, and completed his Ph.D. in Anatomical Sciences at Stony Brook University in 2008. He joined the staff at the Alf Museum in June 2008, as Augustyn Family Curator, and was appointed Director of Research & Collections in 2015. 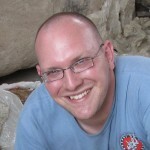 In addition to his duties at the museum, Farke is on the science faculty for The Webb Schools, where he teaches courses in paleontology for high school students. Farke’s research interests focus on exploring the Cretaceous continental ecosystems of North America, particularly the ceratopsian (horned) dinosaurs, with active fieldwork in Utah, California, and Wyoming. He is a volunteer editor for PeerJ, blogs for Public Library of Science, and maintains active interests in the paleontological aspects of education, public policy, and science communication.